The global distribution of vegetation zones has already been observed and documented by scientists in the beginning of the 20th century. A strong relation between climate and vegetation lead to the theory that under a certain climate the vegetation will develop into an equilibrium vegetation type, the climax. This concept, however, is not able to explain all the observed vegetation patterns, as due to disturbances and changing environmental conditions such a climax state is often not reached. Today, satellites observe the state and changes of vegetation with increasing detail, and facilitate new insights on the relation between climate and vegetation. Based on these satellite data, an analysis showed that within the tropics (Hirota et al., 2011; Staver et al., 2011) and in the boreal region (Scheffer et al., 2012) certain tree cover fractions are much more frequent (sparse tree cover, a tree cover of 20-40% and very high tree cover) while values in between are virtually absent. Filtering the dataset more carefully for similar climates showed that even under the same climate different states of the vegetation are possible. This observation is an important hint for the stability of ecosystems, as the high frequency of certain states can be interpreted as high stability or high resilience. A high frequency of dense forest and low tree cover ecosystems therefore means that if a dense forest ecosystem occasionally experiences a strong decrease in tree cover, the ecosystem can become instable and eventually switch to the lower tree cover state from which it may not recover to the initial dense forest. Transitions between the alternative stable states usually occur abruptly, with an accelerated rate of change. Figure 1: Fire-vegetation feedback. Fire and vegetation interact, vegetation provides the fuel for fires, the flammability of the fuels depend on the vegetation type. Grasslands or Savannas provide fuels with higher flammability and also have a microclimate that increases fire occurrence compared to Forest ecosystems. For the tropics, the observed multimodality of tree cover can be linked to interactions between vegetation and fire: The high flammability of grasses promotes high fire occurrence leading to an increase in grass cover, while forests with closed canopy support a humid microclimate that suppresses fire and provide good conditions for tree establishment (Figure 1). This feedback pushes the system in one or the other of these two contrasting states (closed forests and grasslands or savannas) and destabilizes states with intermediate tree cover fractions. Gitta Lasslop and colleagues improved the representation of fire within the JSBACH land surface model. The new process-based SPITFIRE model simulates interactions between fire and vegetation. This new model version enabled them to investigate the occurrence of multi-stability of vegetation due to the fire-vegetation feedback globally. Areas with multi-stability can be identified by starting a simulation with grass vegetation and comparing it to a simulation that was started with forest vegetation. If the vegetation of the two simulations does not converge, the vegetation has multiple stable states. Multi-stability in the model occurs in savanna regions (Figure 2a), as the analyses of satellite data suggested. The multi-stability only occurs if fire is included as an interactive process. If fire is switched off, the tree covered area converges globally (Figure 2b). The regions with multiple stable states are characterized by an intermediate fire regime, lower fire occurrence leads to stable forest ecosystems and higher fire occurrence to stable grasslands or savannas. Figure 2: Model simulations with JSBACH-SPITFIRE: the vegetation is bistable in savanna regions, mainly in Africa and Asia (a). The global tree covered area of simulations initialized with grasses and initialized with trees converges if fire is switched off (b, dashed lines). 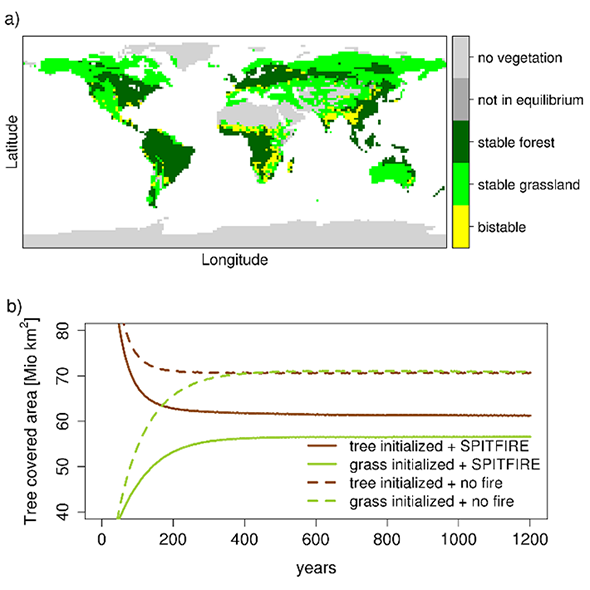 If fire is included as an interactive process the global tree covered area is lower for the simulation initialized with grasslands (b, solid lines). For the boreal regions, the JSBACH-SPITFIRE model so far does not show multiple stable states. The mechanisms leading to multiple stable states in that region are not sufficiently well understood and likely not yet represented in global models. Beniamino Abis and Victor Brovkin (2017) analyzed satellite vegetation datasets together with a number of datasets on environmental conditions such as temperature, soil moisture, permafrost, etc. Surprisingly, they found a number of regions in both, North America and Eurasia, where the tree cover is significantly different despite the same environmental conditions (Figure 3). These regions covering 1.1 million km2 are identified as potential multi-stable regions which could abruptly loss or gain tree cover. Moreover, they find that fire disturbance in combination with its effects on the environment might play a crucial role. "The satellite data show a possibility for much higher role of fire on boreal forests than represented in the Earth System models", concludes Beniamino Abis. Figure 3: Possible alternative tree-cover states over North America (left) and North Eurasia (right). Legend: the first name refers to the observed vegetation state in a specific grid cell, the second name corresponds to the possible alternative state found elsewhere under the same environmental conditions. The implications of multi-stability, e.g. the accelerated rate of change when switching from one stable state to the other and the dependence on initial conditions, are important properties for the resilience and management of ecosystems. A better representation and understanding of vegetation dynamics especially under climate change is therefore not only important for an improved model performance but can also contribute to an improved human adaptation and mitigation of climate change impacts. "Neglecting these nonlinear effects in Earth system models underestimates effects of climate change on vegetation", summarizes Gitta Lasslop.